A sprawling show—both literally and figuratively—Ends of the Earth: Land Art to 1974 is the first-ever major museum survey of the Earth or Land art movement, now showing at the Museum of Contemporary Art Los Angeles’ Geffen Contemporary. Make no mistake, this highly significant exhibition comes at a critical moment. Also recognized as Environmental art, this exhibition takes on heightened meaning as the United States experiences the most comprehensive drought in over a half century; season after season temperatures reach their highest averages on record; and the polar ice caps melt and the sea level rises. In the face of widespread willful ignorance and political dysfunction regarding climate change, any endeavor that brings attention to this pressing matter is welcome, especially a cultural one. Former MOCA Senior Curator Philipp Kaiser and UCLA professor Miwon Kwon’s revisionist exhibition explores the early 20th-century origins of the movement that took form in the 1960s. However, I would argue, the exhibition can also be a point of departure to consider much earlier meanings, uses and depictions of the landscape. As I discussed in my recent review of Michael Heizer’s new permanent installation Levitated Mass at the Los Angeles County Museum of Art, he among other artists operates in an ambit informed by centuries’ old aesthetic ideas (more on this later). Michael Heizer and Walter De Maria, two of the giants of Land art, hover over the exhibition, but regrettably never alight. 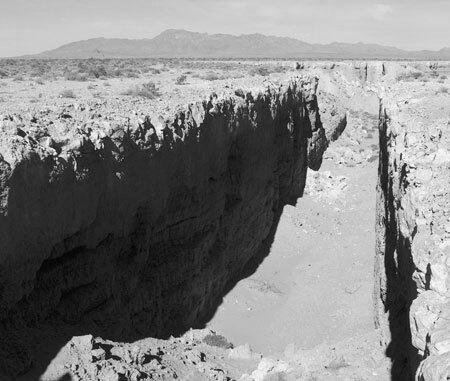 The two declined to participate—this despite the fact that MOCA owns the early and highly important Heizer earthwork, Double Negative (1969-70) in the Nevada desert—both drawing a distinction between the inclusion of documentation and the original work. This is all well and good, but begs the question, why not create a new work or re-create earlier works, as a number of other prominent artists did here, such as Richard Long, Robert Morris, and Alice Aycock? The curators as well as Virginia Dwan, the famed gallerist who donated Double Negative to MOCA, go to considerable length in the catalogue to try to account for the lacunae. One of their premises—correct I might add—is that in spite of the obstacles of presenting Land art within the spaces of the museum, that it can be done. The present exhibition is certainly proof of that. These issues are similar to those faced with Performance and Conceptual art in a museum setting, but as the recent, highly successful exhibitions of Marina Abramovic at MoMA and Tino Seghal at the Guggenheim attest, these movements too can be presented retrospectively. Both Heizer and De Maria have made smaller-scale work that fits within the confines of a building. At any rate, these two great figures are greatly missed within the context of this otherwise near definitive survey. At least Double-Negative is reproduced in the MOCA catalogue and visitors to Ends of the Earth can take in tandem Levitated Mass at LACMA during the run of the MOCA exhibition. 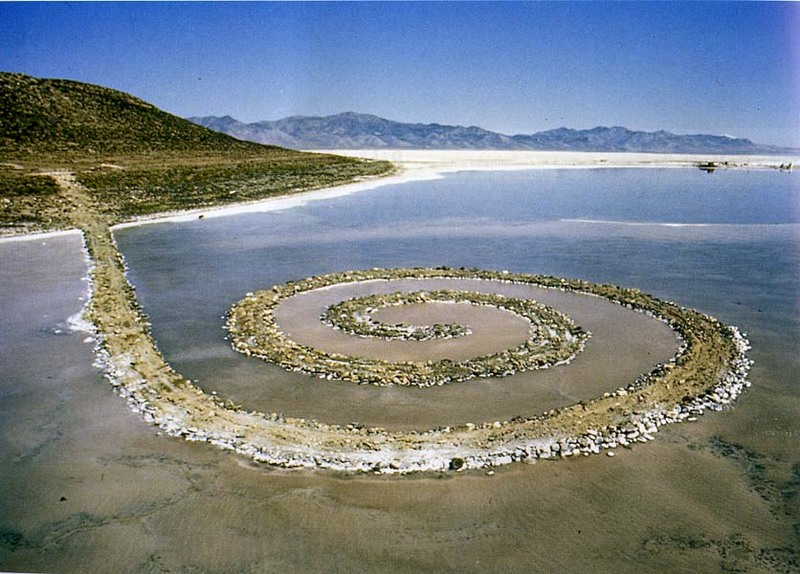 Robert Smithson, arguably the leading proponent and practitioner of Land art, understood these issues with his creation of “Site” and “Non-site” works (the latter being abstracted “containers” of meaning: a photograph, or sculpture, anything not the “Site”). I understand that Heizer and De Maria objected to photographs of their work being included—as the photograph is NOT the work. However, the key role played by photography in the documentation of Land art cannot be denied nor can Heizer’s use of the medium in the display of his work. The present exhibition is filled with photography which transcends documentation to become an, if not the, object. For example, Dennis Oppenheim, another one of the seminal figures of Earth art, perfected early on a consistent manner of presenting documentation that amply performed the role of object surrogate, consisting of photos of the completed work or in stages of production; a map of the site (often aerial) with location indicated and finally, lines of descriptive text (reminiscent of the typewritten scores for conceptual pieces). One of the exhibition and its catalogue’s most interesting and important contributions is the analysis of the systematic way in which media assisted in the development of Land art. Not only in the aforementioned issue of photography as both document and object, but in artists’ use of film and television and the Press’ role and interest in Land art at the very moment of the rise of the Ecology Movement. A brief note on the publication itself: Ends of the Earth is surely one of the most engaging exhibition catalogues to be published recently. It is handsomely designed—in retro ‘60s or ‘70s fashion—in a highy accessible format. While the essays vary in interest and importance, the chapters on media and Land art and the role of the desert in Earth art stand out. The annotated checklist is a model of its kind. The exhibition prologue embodies one of the curators’ premises, that Land art and its early origins weren’t exclusively American, but rather international. While I’m not sure that this wasn’t previously understood, the point is worth repeating. As a result works by artists ranging from Yves Klein and Jean Tinguely to Hans Mack and a very handsome work by the Italian Arte Povera artist Giovanni Anselmo (Direzione, 1967-68, a compass embedded into a triangular block of granite) are featured up front. The opening sequence is dominated by Tinguely and Isamu Noguchi, with the latter’s 1933 earthworks project for the Midwest (Monument to the Plow) and his bronze sculpture model for a larger Tortured Earth (c. 1943). Noguchi’s career-long work in the design of gardens, outdoor sculpture and installations are an evident influence in the construction of large-scale earthworks by later artists such as Smithson, Heizer and more recently, Maya Lin. One of the delights of the show is the inclusion of artists I would have never otherwise thought of in this context. To cite only a few, in the exhibition’s front sections one can see an early work by Barry Flanagan, who became better known as an objective sculptor (one of his favorite motifs being that of the rabbit). Here his Ringn (1966)—a small pile of sand with an inverted cone formed by the removal of four handfuls recalls the contemporaneous exploration of negative space by Claes Oldenburg and Heizer, among others. Ed Ruscha is represented by one of his artist’s books, Royal Road Test (1967). He and Mason Williams and Patrick Blackwell had experimented with tossing out a Royal typewriter out of a car window on a desert highway. Most surprising was Paul McCarthy’s typewritten scores for actions, including the Digging a Trench across the Desert (“I tell a friend I will spend my summer digging a continuous, straight, shallow trench…”) of 1967. Carl Andre is represented with the Quincy Book (1973). It is Minimalism as personal reminiscence, the landscape of his hometown of Quincy, Massachusetts, littered with human detritus. Right at the exhibition’s beginning, the origins and debt—indeed the continuity from—Conceptual work, Miminalism and Arte Povera are deftly demonstrated through these as well as other pieces. Ends of the Earth begins in earnest with the re-creation of several seminal exhibitions which defined Land art in the 1960s. Interesting not only art historically, it effectively arrays up front the leading protagonists of the movement. The exhibitions were the 1968 Earthworks at the Virginia Dwan Gallery, New York; the following year’s Earth Art at the Andrew Dickson White Museum of Art at Cornell University; and Gerry Schum’s completely novel Television Gallery Land Art exhibition broadcast on West Berlin public television in April 1969. The Dwan Gallery show collected the leaders who were rapidly becoming the usual suspects: Andre, Herbert Bayer, Walter De Maria, Heizer, Stephen Kaltenbach, Sol LeWitt, Morris, Oldenburg, Oppenheim and Smithson. A compelling work with great presence is the moving and mysterious Earthwork AKA Untitled (Dirt) Robert Morris recreated for MOCA, a primordial mass of dirt, grease, and rolls of felt (think his better-known large scale felt pieces). 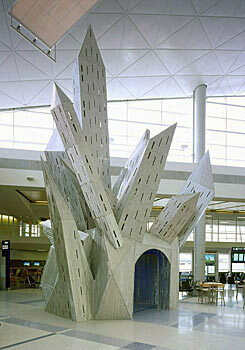 A key component of Dwan’s show was Smithson’s 1967 proposal for the Dallas-Ft. Worth Regional Airport. Completely revolutionary, it would have integrated public art in a way not yet seen nor attempted since. Smithson invited three artists to contribute: Andre (a dropped bomb and a rolled steel causeway), LeWitt (a buried cube) and Morris (a circular earthwork). Smithson himself conceived of “Wandering Earth Mounds” and gravel paths in and amongst the airport runways (again prefiguring Maya Lin) as one of his own contributions. The massive Dallas-Ft. Worth Airport of today—a major airline hub—is nothing like what Smithson envisioned, but ironically, almost 40 years later Dennis Oppenheim was commissioned by the airport to create one of his large-scale Public art sculptures Crystal Mountain (2005), an engaging and dramatic Cabinet of Dr. Caligari-like sculpture. Public art’s relationship to and progression from Earth art is another story, but clearly a related one. While the Dwan Gallery exhibition, as influential as it was, was relegated entirely to the indoors (no suitable outdoor spaces were found despite scouting in New Jersey), the next important exhibition did feature outdoor work. Land art guru Willoughby Sharp curated Earth Art at the Andrew Dickson White Museum at Cornell University three months after the close of the New York gallery show. Once again, usual suspects Morris, Oppenheim, and Smithson participated, while De Maria and Heizer withdrew their works after the opening (history does repeat itself…). Significantly, Europeans Jan Dibbets, Hans Haacke, and Richard Long were also included. Indeed, Dibbet’s series of conceptual photographs employing anamorphic drawing (a trapezoidal design that “corrects” or resolves into a square from the single point perspective of the photographer) are beautiful and intriguing. Two from the 1968 Perspective Correction series are included here: the triptych Diagonal/Crossed/Diagonal and Square Perspective Correction/Large Square. His A Trace in the Wood in the Form of an Angle of 30 Degrees—Crossing of the Path documents an outdoor intervention of a forest path with a striking V-shape made by Dibbets for the Cornell exhibition. Dominating this section of the exhibition is Oppenheim’s Gallery Transplant. One of two or three of Oppenheim’s gallery transferences (another was done for the Stedelijk Museum, Amsterdam), the artist worked with a floor plan of the Dickson White, and to scale transplanted the dimensions and contours of that space to an area outside the Museum, outlined in the snow and dirt: Gallery 4 to Kearney, New Jersey; Gallery 9 to elsewhere in Ithaca; Gallery 1 was incised in an iced-over pond in a bird sanctuary in Ithaca; and so forth. Apart from the sheer poetry of the effort to conceptualize exhibition space outside the museum (a hallmark of Earth art), as well as the dialectical relationship between indoors and outdoors, the significant act here was Oppenheim’s imposition of a theoretical framework on a physical location. This and the elements of chance and the reversal of the artist’s relationship to the artwork—in other words that the object performs the action—are important components in Land art. Like the occasional flock of birds or the melting ice which changed the work from the artist’s original intention, Oppenheim reveled in this mutability. As director of Price Tower Arts Center in Oklahoma, I commissioned an outdoor installation from Dennis in 2005 as part of a larger exhibition of his recent work in Public art: Dennis Oppenheim: Indoors, Outdoors. The installation, Domestic Quarrel, comprised of a metal framework attached to which were two marionette-like houses, rather like a portable theatre. A few short weeks into the month of March, and the Oklahoma winds began to play havoc with the two houses, smashing into each other to the point of destruction. Concerned about liability to the public (as well as the longevity of the artwork), I consulted Dennis who was elated that these chance events were activating his sculpture in both intended and unintended ways. This was vintage Dennis and a hallmark of his amazing and eclectic career, where any action and its result could be a work of art. While at the Aspen Institute in 1970, the artist made Ground Mutations, a 24-hour performance where two marchers moved military-style in a 100 ft. sq. by 6 ft. deep trench while a drummer marched along the bisecting diagonal. Meant to be seen from the air, the impressive documentation seen here includes a line drawing of the plan, an aerial shot of the terrain, and photographs documenting the actions. In the installation at MOCA, the field of action in the Aspen project is beautifully echoed directly across the way by Cai Guo-Qiang’s Crop Circles installation—a mown grain field mounted on the gallery ceiling, an inverted aerial view—as part of Cai’s Sky Ladder exhibition. 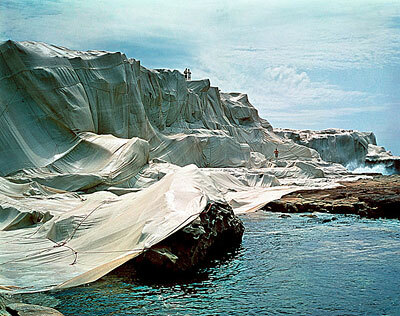 Nearby is a small section devoted to Christo and Jean Claude’s 1969 Wrapped Coast—One Million Square Feet. Called the largest single artwork ever made, the artists wrapped the coastline of Little Bay, Sydney, Australia, in their trademark fashion. As is typical with these projects, the artists financed the work with the sale of meticulously made models, gorgeous drawings, and shallow-relief and mixed media sculptures. These extraordinary objects both document the actual land intervention and are extraordinary works of art in and of themselves. Simultaneously, these objects in a very real sense facilitate the action, which like the work of Oppenheim and other Land artists, transcended just one identification—Land art—and dip into performance art. The variability of approaches and attitudes of those who have participated in the Land art movement over the years is amply demonstrated throughout the show in some artists’ comfort level with the objectification and commodification of their output and compatibility with the museum and gallery systems versus others who reject the system. 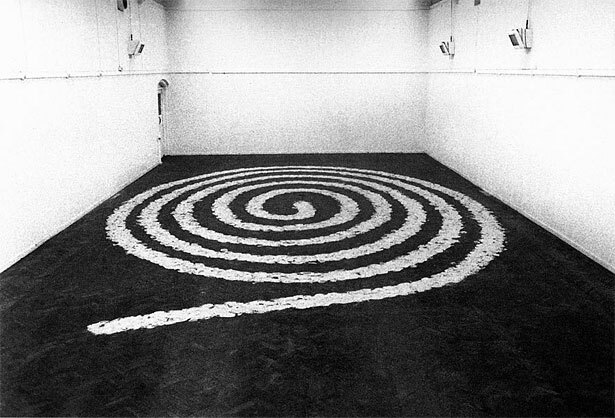 Elsewhere in Ends of the Earth, Alice Aycock’s desert-evocative, large-scale floor installation Clay #2 (1971) has been reprised by the artist and is grouped with works by several other woman artists such as Ana Mendieta (just as the Latin American artists are largely grouped together in the upstairs space). 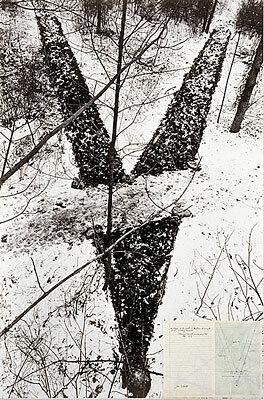 Mendieta as a rule featured her body in most of her works and in Imagen de Yagul (1973), she lay in a Meso-American burial pit covered with plants and flowers—a synthesis of ancient American influences such as Heizer’s with the performative qualities of Oppenheim—two of whose films the curators have sensitively paired with Mendieta’s work, including Back Track (1969), showing Oppenheim dragged along the beach, his body making an emphatic mark, just as Mendieta would leave her imprint in the grass or ground. 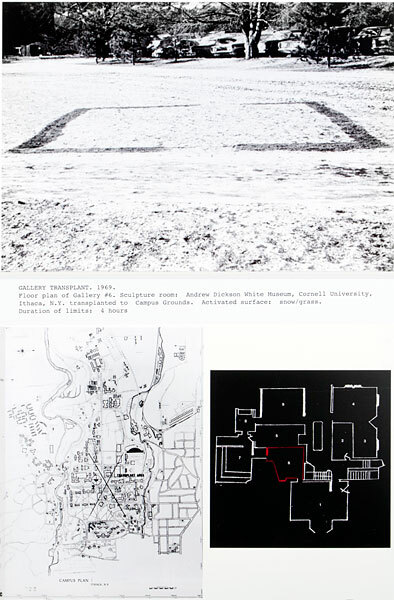 Aycock, formerly married to Oppenheim (in this small world of the usual suspects of Land art), is also featured in the adjoining gallery with two drawings that Conceptual and architectural, including Architectural Project Summer ’73 (Low Building with Dirt Roof) (1973). Sharing the gallery is Superstudio, an Italian architects’ collective who conceived of tremendously visionary projects such as Cube of Forest on the Golden Gate (1970-71), a section hovering over the famous San Francico bridge and part of a grid-like superstructure covering the entire planet’s surface. This gallery alone demonstrates the hugely important relationship of land art to architecture. Appropriately enough, displayed close by is Robert Smithson’s Spiral Jetty (1970) in the form of an essay and the video (both of which he considered “non-site” works; artworks in their own right). In the popular imagination, Spiral Jetty has come to represent Land art, and its Paleolithic form—like Heizer’s earthworks—conjures up for us an ancient, subconscious past. Built in the Great Salt Lake in Utah and 1,500 ft. in length, the piece speaks of ancient influences, architectural ambition, and environmental awareness all at once. Richard Long—who rejects the Land art appellation as he defines the movement with the great earthworks of Smithson and Heizer—recreates for the exhibition a very beautiful and evocative installation of one of his walks: A Line the Same Length as a Straight Walk from the Bottom to the Top of Silbury Hill. Originally done in the same year—1970—as Smithson’s Spiral Jetty. It is Nazca line-like, a spiral drawn in clay on the floor. It is also notable that Silbury Hill is a Prehistoric man-made hill, a mysterious, ancient earthwork. A Line the Same Length… is appropriately paired with Long’s photograph Circle in the Andes (1972), underscoring his interest in ancient Andean earthworks. Ends of the Earth examines recent artistic practice but can also serve to remind us of the very origins of humankind’s perception and ordering of Nature and its depiction. Landscape as a subject in art came into its own in the late 16th and early 17th centuries; aesthetic concepts regarding landscape were highly formulated by the late 18th century. Among these were the Sublime—Edmund Burke’s quasi-religious notion of awe-inspiring, yet terrible Nature—and the Picturesque, the Rev. Gilpin and later Uvedale Price codifying what was most pleasing to portray in the depiction of landscape. More recently, Robert Smithson himself helped shape the discussion, not only as an artist but as a writer and thinker. In an important 1973 article in Artforum, Smithson endeavored to connect Land art with the British landscape tradition of the Picturesque and its manifestation in the New World with Frederick Law Olmsted’s Central Park, for example. Sidney Tillim had already connected the Picturesque with Land art in his review of the Dwan Gallery show (“Earthworks and the New Picturesque,” Artforum, December 1968). Tillim cites, for example, Dennis Oppenheim’s project displayed at the Dwan Gallery to mow rings around Mt. Cotopaxi in Ecuador. It was this unrealized project that the artist’s widow Amy Plumb Oppenheim reminded me was the beginning of his concept of transference, the imposition of a theoretical framework on a physical location (circling back to origins in Minimalism and Conceptual art). While reminiscent of 17th-century French painter Nicolas Poussin’s rational ordering of landscape, Oppenheim’s choice of site also evokes the 19th-century American Frederic Church’s epic paintings of the same subject, in particular his Cotopaxi of 1862 (Detroit Institute of Arts). Indeed, as presented by Andrew Wilton and Tim Barringer in the 2002 Tate Britain exhibition American Sublime: Landscape Painting in the United States 1820-1880, the Wilderness generally but more particularly the vast, geological antiquity of the American West served up the Sublime best, fulfilling Americans’ expectation of “Manifest Destiny,” that the immense continent was ours pre-ordained. MOCA’s exhibition discusses—and the evidence is plain—that Land art in the 1960s and ‘70s found its fullest expression in the deserts of the West—Smithson’s Utah, Heizer’s Nevada, De Maria’s New Mexico—and I would argue, the concept of the Sublime represents a powerful connection here between the past and the present. It is not the Picturesque tradition as Smithson and Tillim would have us believe, but the Sublime’s ancient, visceral emotional responses that the best of Land art elicits. Ends of the Earth is filled not with pleasing renditions of the landscape, painted, sculpted or otherwise. Rather, it is a sober telling of our recent artistic relationship with our planet that plumbs the depths of the subject, filling us with hubris—and , I hope, a little fear—at our presumptous attempts to bend and shape Nature to our will.